I bought this box in November last year. The cigars have been kept intact in their box within one of my humidors since then (approx. 2 months). During this time I was having a little trouble keeping the humidity levels up and I think my humidification was fighting a bit of a battle with my central heating system. So they have been stored in as little at 59% RH and as much as 80% RH when I initially added some of those 'cigar keeper' crystals. I don't think that would make too much of a difference in two months, but I thought I'd better mention it. Wrapper is smooth for a maduro wrapper. I only noticed one prominent vein under the band. Absolutely perfect construction otherwise, no soft spots or bulges anywhere. A good refined aroma albeit a bit weak in strength. A racing start right from the initial lighting. This stick needed no 'lead in' time to get going like with most cigars. The initial taste was reminiscent of dry roasted peanuts. This yielded to an aroma of lightly roasted coffee. Interestingly enough, as the cigar developed, the coffee flavour became more chocolately. Imagine the smell of a cup of good coffee being slowly stirred with a milk chocolate spoon. My initial thoughts about construction were correct. The ash was a solid cylinder which didn't 'lean' to one side at all. When the first piece eventually fell off half way though the smoke, I could see minimal coning. I only relit once and they was only when I had left the cigar for a few minutes near the last 1.5 inches. This is a complex smoke. It definitely had a muted strength to it, as if there was a distant Bolivar trapped inside waiting to break out but never quite succeeding. I've smoked these before but I remember them being stronger than this one. For me, this was a cross between an El Rey Del Mundo Choix Supreme and a Paragus D4. The result is a smooth tasty smoke with a subtle marriage of flavours. Would I smoke these again? A resounding "YES"! These are currently in my top 3 favourite smokes and I'll be most upset when I finish the box since they are now very difficult to find in the UK. I am struggling to find anything negative to say, but in my opinion it was a little too light for an evening smoke. Personally I prefer something heavier at the end of the day. My advice? Try one if you can! Nice review, straight and to the point, as it should be. At times I could actually taste the cigar. A good straight forward review of one oy my all time favorite cigars. I like the authors notion of the taste being a blend of an ERDM CS and a Partagas D4. Interesting! Nice and brief! No info on booze matched, but detail on flavour position in Havana range. Gives at least a fighting chance of knowing if you may or may not like it. I agree with the reviewer so that kinda throws my bias! Now this is my first foray into the RyJ brand so I was not quite sure what to expect, especially from an Edicion Limitada. However, looking at this baby in my humidor got to be way too much self-control, so I took the plunge and took it with me to a softball game. Conditions were slightly windy, with temp about 78-80 F or about 25-26 C, sunny with little cloud cover, 7:30 pm. The robusto classic shape, but the wrapper was a very smooth, oily, very dark specimen. The wrapper was just gorgeous to look at with the dark, shiny sheen to it. I was immediately impressed with how solid it felt, but the 'give' was there for the squeeze test. The triple cap was clean and precise, with the edges all around very crisp. Cut was very clean with no hangers or hard spots. Pre-light draw was easy, not having to work hard to get an adequate pull. Lighting this cigar was one of the easiest I've ever had to do. It took to the flame straight away, but didn't burn hot at all. The smoke from the first draw was a little light, but thickened up appreciatively very quickly after that. Thick gobs of smoke rose from this beauty as I was reminded of chocolate and leather. The ash was a very dark grey, tons of plume present throughout. It held up very well, as I only had to ash 3 times from start to finish. The flavor profile on this cigar is not simple. The only other cigar that had this effect on me, so far, has been a Partagas Serie D No3 EL. There are very subtle degrees of flavor depending on where you are in the cigar. The first part, as I indicated above, gave me an almost dark chocolate flavor overall. There was lots of smoke, which I love, and it never decreased in volume as we went along. As I worked into it however, I got more of a calmed down version of those flavors, along with hints of cedar and something I would liken to 'meaty'. I loved it as I felt like I had just been satisfied by a very good filet. This stayed to varying degrees through the whole stick. The finish didn't just slide right by without you noticing it. The flavors built up right from about the two-thirds mark until you decided you were done with it, which in my case was until I couldn't hold it any longer. The flavors did not overwhelm you however at the end, as some are prone to doing. They complimented each other, but one didn't come through overtop of the others. In conclusion I loved this cigar I would love an opportunity to have many more of them. The experience I had with this cigar has indicated to me that I must expand into the RyJ line to see if we can have this many, many more times.. Excellent review. Better than average description of flavors and characteristics. The only question that remained unanswered, who won the ballgame? This is a puerile review. I will cite just two examples. (a) shiny sheen" -- what other kind of sheen is there? (b) "The ash was very dark grey, tons of plume present throughout." Plume is found on unburned wrappers, not ash. Second paragraph was a gem to read. Obviously experienced cigar smoker given his knowledgeable references (such as the cigar not burning hot). This one makes me want to buy a few boxes! Living in Florida has many advantages, and one of which is that you don't have to leave home to have truly great experiences. The beaches are close. There is wonderful wildlife everywhere, and there are many forest areas close by. These experiences are greatly enhanced when coupled with a great cigar. I have a close friend who also enjoys cigars. We can't always afford them, but when we can we take the time to enjoy. I purchased a box of Romeo Y Julieta Churchill's from C.GARs in November of 2002, and decided to try the first 6 months later. Jorge, and I opened a bottle of Johnnie Walker Blue, and took our respective seats on the porch. My porch looks out over a wonderful-wooded area with lots of wildlife. I opened the box of R&J's, and we looked at its contents. The first thing to note was the unbelievable aroma that emanated from the box. It was an earthy, hearty, deeply rich bouquet that enticed you to move closer for fear that it might escape. It didn't! As the even wore on I would occasionally pick up the box to taste the fragrance, and it never left. The sticks were clones of themselves. They were perfectly matched, and lined up it such a way that it was hard to believe that such perfection exists. Medium chocolate brown with a hint of tooth is how they presented themselves. There was a light oily sheen that made one think that they had been marinated some how, and left out to ripen. Jorge noted, when he picked up one of the smokes it was very firm, and commented on whether this might be a sign of being rolled too tight. We would soon find out! We spend some time inspecting the cigars. You can't help, but spend time looking, feeling, and touching such radiant treasures. The cap was identical on each stick. It made two wraps, and disappeared into the body of the cigar. The cut was even, and crisp. I lit the cigar. The flame caressed the foot in a gentle manner as it began its slow burn. As the cigar took the flame a wonderful earthy-chocolate trail arose suggesting a hint of what was to come. The experience began with a spicy build up that was peppery with notes of coffee bean. The draw was very nice, and allowed you to savor the smoke with ease. R&J Churchills of the past have been very disappointing due mostly to problems with their draw. That was not the case with this cigar. As the experience moved into its next phase (about a Â¼ of the way) the peppery/bean gave way to a chocolate/coffee blanket that seemed to embrace each and every taste sensor in my mouth. What a smoke! Then just as it seemed it couldn't get much better a new partner joined the dance. Half way down the stick a woody taste attached itself to the experience. I looked over at Jorge, and noticed he was glancing off into space. As I too looked up the sky was creating a static light show. Or, at least that's what I call it when lighting moves sideways across the sky. It seemed to cut the huge cloud of cigar smoke that lingered just above our heads. We continued our journey. Jorge smiled, and I knew what was coming. Its like a running joke with us... its moronic, and clichÃ©, but someone needed to say it anyway, "You know it doesn't get any better than this!" The experience ended with a long creamy finish that complemented the scotch perfectly. I'm also thinking a medium dry cabernet would have also been nice. Well, ...maybe next time. Lagging behind the lightening was a cool wind, and a light rain that calmed the evening even more. What a great experience! I feel somewhat cheeky posting a review, my cigar smoking experience being relatively recent and definitely lacking but here goes. The cigar itself has a nice dark wrapper with a slight sheen to it. Looks really good. The smell coming from it is amazing, definitely the nicest unlit aroma I've come across. After toasting the end and lighting the cigar, the first puff or two tastes quite bitter but then settles into a taste like wood and leather, producing huge loads of smoke with no effort in the draw. I find it difficult to separate the moment from the cigar so I should explain that it's now 9.55pm and the other half is scowling at me from the sofa as I have the window wide open and its freezing. The combination of guilt and real enjoyment of this cigar is keeping me going. The situation makes it feel like "forbidden fruit". After the first third of the cigar, the ash is a nice dark grey with concentric circles in it from every draw I've taken and the burn is completely even. I'm not sure if anyone else does this. I've just left the room for a few seconds so that I can come back in and smell the aroma in the room. The heavy aroma of the "sweet smelling" smoke is pleasant and inviting instead of feeling oppressive. The first drop off of ash has now happened and I'm approaching the middle of the cigar. The flavour has rounded and some slight spicy after taste is being left in the mouth....very pleasant. The smoke is still cool, the taste is amazing and the other half is now asleep so all traces of guilt have disappeared. The flavour now has a slight taste of coffee and licking the lips gives ??? ?no it can't be? ?..a hint of the much fabled "chocolate" ? I'm under an inch away from the band now and the smoke is starting to warm and a little of the bitterness from the beginning has returned but is not unpleasant. Unable to help myself (being a smoker) I've just inhaled a small draw and there's no harshness. Just a really smooth deep flavour. The lips are now starting to tingle and not wanting the cigar to end I've just unpicked and removed the band so I can stay with it. The smoke now has a nice warmth and the aftertaste has me craving a nip of rum so back in a moment. Yep....the rum definitely hit the spot. I now have warm, spicy tingling lips from the cigar and the warmth in the chest from the rum sliding down. I'm beginning to burn my fingers while drawing now....so it's time to reluctantly lay this one down, close the window and settle into the chair with the rest of the rum. God I enjoyed that one... Next time I'm going to have to get a bigger Romeo. Christmas was approaching. Around mid December '02 my wife wanted guidance regarding a Christmas present for me. I asked for and received and box of 25 of these and some other goodies (including some gorgeous RyJ POW) - I guess I'm spoilt! Appearance - As this was the first box of Havanas I had ever opened, they looked just great . A good colour match for all the sticks, with no variation I could see . I believe, since they are a nice even dark reddy, brown . There were nice smooth wrappers with only a little "tooth" This is my favourite shape and the sticks had an overall classy, elegant appearance . Aroma- I found this so mouth-watering I thought about taking a bite out of the cigar . I wasn't conscious of any food references or similar nonsense . I expected and discovered a wonderful aroma of Cuban tobacco and, bless me, that's exactly what I got . Burn - As I have said for me this was new territory . To be completely frank, while consuming the first two or three cigars there was evidence of plugging and some inconsistency, in the burn . However, as time went by and the smokes got a little older and I got a little less panicked I found that if there appeared to be a burn problem I could simply ignore it and, to a large degree, the problem would sort itself out . . Note, to self, for the future DON'T PANIC . Taste - Well I was impressed! I should mention that these cigars are being compared with other smokes where I have sampled just one or two examples of the vitola . I can say that they produced plenty of rich flavourful smoke . However, to a certain extent I would comment that if every cigar of this vitola was like the first two or three that I smoked then they would be a classy and tasty Havana at the start, merging into a spicy medium to full bodied smoke in the middle and graduating to a fairly hot, harsh, oily finish which leaves an aftertaste that may remain for some hours . However, towards the end of this box of wonders, the hint of the cigars they would develop into became apparent . A more regular burn was noted . They seem to remain cooler right to the nub . The interesting spicy, complex middle seems to last right through to the bit where you are going to burn your fingers . Although I'm still a beginner, even with my limited knowledge, I can foresee that these are going to be a great cigar . The problem is that if you buy a box and smoke them right now you will probably find they don't compare favourably with piramides from Montecristo, Cohiba, Partagas or Diplamaticos . So in conclusion I think I would look to other vitolas before coming back to these . But I am, principally, left with one thought concerning cigar reviews and reviewers . Although I am indulged outrageously, by my lovely spouse, I have neither the financial resources, humidor capacity or patience to buy a box of cigars and leave them unsmoked for two or three years . Perhaps the cigar industry could have a think about the cigar aficionado of the future (like me) . I am not a millionaire and I do not have a walk in humidor built into my palatial home . Whenever cigars are marketed, sold, reviewed or commented on, wouldn't it make sense to add some guidance about whether or not they should be smoked NOW . As an analogous scenario, would you buy a two or three year old bottle of ChÃ¢teau Latour in the knowledge that the wine should not be opened for another twenty-five years or so? Appearance: Rustic, with a nice cap. A big, elegant looking cigar begging to be smoked. The band had yellowed and showed it's age. Pre-Light: The draw was very smooth for such a long cigar. Taste on the lips was peppery. Post-Light: The first draw on this long beauty was full of rich and deep tobacco flavor. It provided a mouthful of smoke with it's easy draw. There were so many changes in the flavors of this cigar it is hard to articulate them all. The first part was peppery and quite full-bodied. As I got closer to midway through, the cigar had turned more medium bodied, but the taste was still rich and flavorful. The last third or so picked back up in body and still offered massive amounts of smoke. The burn needed to be corrected only twice over the two full hours of smoking. There was one re-light at about the two-thirds point, when I had to take a break. The finish left you with just enough to want to take another draw. The aromas of the tobacco burning were delicious. Conclusion: This cigar takes a lot to smoke it. Not only the will-power of putting fire to such a classic that I may never have another opportunity to try, but also in the time needed to be put aside for smoking it. To get the full effect of such a exquisite smoke the smoker needs to be well tuned to the cigar from start to finish. While I smoked this one on the company of friends at a charity event, I think it would have provided an even better smoking experience in front of a fire with nice glass of aged rum. Thus, allowing the smoker to consume the ever changing profile and enjoy it as it deserves to be enjoyed. I was pleasantly surprised when I was picked to be a Taste Tester and was looking forward to receiving the package of my test sticks. Of course shortly after getting the good news, I was sent off to a whole 'nuther part of the country for work and wasn't home to test right away. As soon as I got home and let the sticks rest a bit more in the humidor (66%), I got cracking at doing my duty as a Taste Tester. I know, it is a tough job, but someone has to do it! The first stick was a bit rough in its appearance with very obvious veining and small bumps. The prelight smell was lovely and I looked forward to the postlight experience. The cigar lit up evenly after a good toast, but my first few puffs were less than exciting. The taste was harsh and tarry. I figured I just goofed during the lighting, but I usually don't have any issues with my microtorch. The taste continued through the first 3/4 inch and then things completely changed. The flavor came around to a very nice medium, complex level. The smoke wasn't very thick, but still it was "chewable" and yielded more and more flavors the longer I held it in my mouth. A downside was that the cigar refused to stay lit once it got to the halfway point and while the flavor stayed very enjoyable through the next inch or so, it disappeared to be replaced with the same tarry taste of the beginning. I gave up on the stick with about 2 inched left. I hate dumping a cigar that early in the game, but between it going out and the taste, I had to. On the positive side, the middle of the cigar made up for all the other failings and I was looking forward to the next two sticks. The second stick was much prettier than the first. It almost made me wonder if they were in fact, the same cigar. My thoughts were dashed when I had the same postlight experience and the flavor of tar hit me. Don't get me wrong, the flavor was not overwhelming and it was easy to smoke through to the good part in the middle. And the good part is a delight indeed. This stick stayed lit and didn't give me any issues until the last inch and a half when I had to dump it for the same reasons as the first stick. The middle was a joy. The flavors were swirling about in my mouth and the more I tried the more I tasted. It was as if it was a multilayered candy with different tastes at different layers. I liked it. The last cigar (sniff) went up in a predictable fashion. I got through the first bit of the cigar and to the good part. I had some increased difficulties with keeping it lit, but it didn't seem to hinder the flavor much. I was able to smoke it further than the first two, but not as far as I would have liked. The appearance of the cigar was in between the two previous cigars; Not as pretty as the second, but not as rough as the first. There was a pretty good sized dimple that I thought might cause a hard spot, but it smoked right past it with no issues. Over all I liked the Cedros 2 and would consider it an excellent everyday cigar. It has a nice combination of flavor and body, but I did find that it had a nicotine punch to it and I had gotten slightly buzzed from it, even after a good meal. I would take that into account of you are affected in that same manner. Its burn and pattern were predictable and repeatable. It is frustrating to know that you'll have to dump it with some much left, but I would like to try some with more aging on them. I can't believe that the 4 or 5 days it took from the first stick to the last had a huge effect on them after being in the humidor for a week, but maybe with a month or so on them, the results would have been different. I don't know how old the cigars were, but I suspect a nice laying down period would only make things better. I would be willing to be a tester for that! Romeo y Julietta Hermoso 2003 Edicion Limitada - I was almost afraid to prepare tasting notes for this cigar. At 6 Â½ x 48, it looks challenging and awesome. The cigar has a matte finish, true Cuban Maduro in color, is smooth to the touch, but it is a bit veiny. It reminded me of an 8-9-8, one heck of a strong cigar. The cigar was very firm, leading me to believe it would be a tight draw. It wasn't; it was a great and easy draw from start to finish. Before lighting, the cigar has a faint salty taste, one which was constant, but not prominent. The cigar cut with a "snap" in keeping with its firmness. My first surprise came when I lit the cigar. It tasted faintly vegetal, but that sense quickly dispersed. I was having my Sunday coffee when preparing this tasting note, at the local coffee house. A lady sitting next to me remarked on the pleasant aroma of the smoke and asked if she could taste the cigar. I was not going to pass up this experience. She said her name was Shegar, but people called her 'cigar.' She said she was from Iran and had tasted "women-sized" cigars in the past. She looked barely old enough to smoke however, and I thought the cigar would cause her to cough. I was wrong. She took the cigar firmly in her grip and without any hesitation, placed it between her lips. On her first puff she removed the cigar and had a nice smile on her face. "Gosh" she said, "this is really tasty, it goes great with my espresso." She was 100% right on! We talked for a bit and then I had to go back to my notes. When she left she asked me if we could meet and smoke a few cigars, together, if I supplied them. As soon as I returned to my office I placed an order with Mitchell for some more cigars! 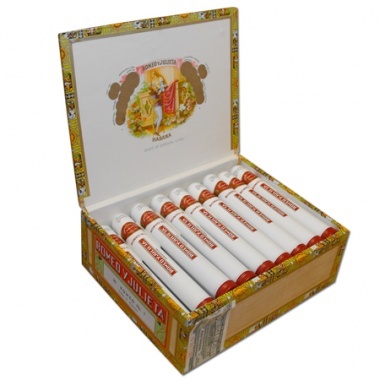 The cigar is a throwback to the great, full-bodied cigars which Cuba was famous for, in the 50's and early 60's. The blend is not for the weak of heart, and a novice might find the cigar too rich. Regardless, it is one which must be bought, now, before they are all gone. Many people complain that the Cubans are blending cigars for the American Market, meaning softer, less strength, and simply mediocre. Not this cigar. Not any of the Edicion Limitadas. These cigars are for the true connoisseur of the leaf. The ash was a dark gray and firm and fully smoked, to the last. As I noted, the draw was quite easy and there was plenty of cool smoke on each draw. It burned evenly and there was not a hint of unevenness. The flavors are of aged leather, dark, unsweetened chocolate, and fully roasted coffee bean. Although strong and full-bodied, the cigar mellowed out about 1/3 of the way down, and the flavors never waned. There was no explosive finish, only complete satisfaction at having been able to spend more than an hour smoking a grand cigar. As with many great cigars, I was left with memories of my smoke, on my palate, for more than one-hour. I opined, last year, that the biggest drawback for the E.L.s was the fact that, once gone, they will never be produced again. Considering this fact, I marvel at the reasonable prices the cigar can be fetched at. Please don't miss out on this perfect example of Cuba from the past. To do this cigar justice I believe we have to look a few years into the future. While these were some of the most beautiful cigars that I have had possession of, they were not quite "ready to smoke." They did however leave a lot to the imagination as to how good they will be in the future. Here is a detailed account of the two samples I was given to review. Sample 1: I chose our regular Saturday morning herf to smoke this sample. It was Easter weekend and I wanted something special to help celebrate the occasion. I chose the lighter, though still quite dark, of the two vitolas. The oil just seemed to drip off of this wonderfully made cigar. There was good solid cap and not one soft spot on this exquisite, dark, double corona. I took out the knife and made a perfect cut across the head of the cigar and took the first pre-light taste. Spicy flavors on the pre-light were a nice feeling. I had high hopes. But, as I drew through the first time I knew that a possibility of a problem was creeping around the corner. Not plugged, just rolled very tight, along with the fact that this was a double corona, caused the draw to be too tight. I torched it thinking the heat would do it some good, but to no avail. It seemed like the longer I tried to smoke it, the harder the draw and obviously, the hotter the cigar got. These problems lead me to not really being able to get a feel for the taste of this beauty. Let's cross our fingers for the next sample. Sample 2: Well, a few days have gone by and I'm happy to say that sample 2 was a lot better than sample 1. I went back to the club on Wednesday to sacrifice the last RyJ LE DC to the smoke gods. Once again, it was a beautiful cigar. Can I say that one more time? These things are beautiful. With the experience of the last sample I thought to myself, why not just let this baby take a nice long nap in the bottom of the cabinet and just tell them it was a bit better than the other sample. But no, I have to "do my duty" and burn this big guy. This one was bit darker than the other sample, but just as oily. There was one small soft spot, but in general it was again rolled very tight and full of tobacco. After cutting the head, with an actual cutter this time, I noticed the pre-light taste to be the same as sample 1. The draw however was a bit better, which gave me a sign of promise. The first 3-4 inches of this vitola were so-so. Not much to write home about to be honest. It had a pretty straight- forward Havana flavor. As I got about half way through the cigar the taste changed and became a nice medium to full- bodied smoke that I know could only get better with some sit down time. It was very earthy tasting with hints of leather towards the end. Post light flavor lingered for a good long while and I can still taste the last couple of puffs as I write the next morning. Overall thoughts on this cigar are that it could be a true classic. The only drawback is you are going to have to be patient. The RyJ LE double corona is one that is going to tempt you throughout it's lifetime because of it's beauty. Don't let this cutie fool you into something you'll later regret. Like most of the finer things in life, at least my wife keeps telling me this, the longer you hang onto them the better they get. It was a happy holiday indeed when I received the three Romeo y Julieta Exhibition #4 Cuban cigars for taste testing a few days after Christmas. Yes Virginia, there is a Santa Claus!!!! All three cigars, my favorite vitola, measured just under the 5" X 48 ring, with a light brown to slightly greenish wrapper with moderate veining. Two of the three cigars were firm and one was soft to inspection. All displayed a fine triple cap. After allowing the three beauties to settle down after their long journey I chose a cool evening on the back porch to clip and light the first cigar. With the orange glow of my portable gas heater to chase the cool night air away, on the initial light the wrapper split a small measure up the cigar, evidence of the need for more time in the humidor. A hint of spice as my palette became accustomed to what would develop into a truly memorable smoke. As I smoked through the first 1/3 of the cigar a wonderful earthy, nutty complexity became apparent. The ash was a dark grey with subtle vein trails requiring a forceful removal only twice throughout the smoke. The final 2/3 simply reinforced the complexity of flavors aforementioned with only a slight but pleasant increase in spiciness. the draw and volume of smoke was surprisingly nice for this vitola. Cigar two and three offered no surprises, one smoked a little more unevenly, undoubtedly the softer roll of the three. Otherwise I would recommend these to any aficionado who likes a complex medium bodied smoke. My only regret is I don't have the other 22 box mates to age in my humidor and savor throughout the year. My sincere thanks to C.GARS LTD. I had the pleasure of taste testing 3 Romeo Y Julieta Cedros Deluxe No 3. The following notes are my observations on each cigar. Appearance: A very nice dark Colorado wrapper with a little bit of tooth and a touch of plume to boot. Solid perfect construction with an even foot and solid cap. The aroma was a very nice and gentle flowery bouquet with a hint of honey...very delightful. This was a solid cigar with no soft spots. A little firm, but not overly so. Lighting: The cut was perfect. Upon lighting the cigar, the subsequent smoke was a full of honeyed aromas with great quantity. The burn was slow to medium although it was a tad bit uneven but not enough to affect the smoke. The smoke itself consisted of thick curls of cool deep clouds. The resulting ash was pewter gray in color with streaks of white, a very nice solid, even ash. Taste: Captures the mouth with hints of cedar and honey mixed with a touch of pepper. Starts fast but then settles down during the first third of the cigar. A very nice lingering finish that does not bite or leave an acrid taste. Settles down to feel like your favorite pair of loafers, sweater or smoking jacket. Some earthy notes begin to develop through the middle of the first third....intriguing. My thoughts go back to my early childhood when I would read the stories of Sir Arthur Conan Doyle and the best detective in the world, Sherlock Holmes. My scene right now is early reminiscent of when Holmes would sit in his smoking chair with his favorite pipe and relay to his faithful Dr. Watson on how if you eliminated all of the impossible, only the possible, no matter how strange, remained. It is these stolen moments away from work that make smoking a Havana such as this all the more pleasurable. The location for this smoke was at the J.R. Tabaco store on Wall Street in NY City . Outside, a Nor'Easter with howling winds and lots of snow is hammering New York City. There is nothing better than curling up with a nice Havana while the world rushes by in its harried pace. Lighting: Even burn, but tight draw. Flavor was a little more intense with same types. Hint of spice on the finish. Burn a little more uneven than the first. Same amount of smoke. Enjoyed at J.R cigars again, in the midst of work. Had a glass of Belgium ale made by Trappist monks. Chimay Ale is the name of my drink. The beer seems to clear my palate and makes my next puff just as intense as my previous.....a nice combination. Uneven burn seems to lead to more of a cedary aftertaste from the smoke. The ash is lighter than my first smoke, around the silver-gray range. More flaky also. Aroma: Still very pleasant, and very Cuban. The smoke itself is not as heavy and thick, not in the same quantity either. 2nd Third settles down just like the first cigar. Am wrestling with the cigar now to get a good amount of smoke out. Between the tight roll and uneven burn, its becoming a challenge. This cigar is like the stock market, difficult to figure out...and I have to tend to it just as closely. The ash at the end of the middle third reveals a hole at the base of the ash....interesting, haven't encountered this before. Less smoke now for every draw. This cigar had a medium burn.....about a 45 to 60 minute smoke with this corona. My thoughts today are about how the stock market has been going through the floor. Everyone here in New York has worry and anxiety in their faces like splashes of mud from a passing vehicle. St. Patrick's Day is not far away and I expect a raucous time as revelers will want to drink their troubles away. Pre-Light: This is a tale of a tragic cigar. I had put this last cigar in the inner pocket of my suit for my journey home. Alas, when I arrived home and opened the plastic bag in which I was carrying it, I had apparently leaned to heavily against a rail or something as the cigar was quite mashed......extremely box pressed would be a better description for this cigar. The wrapper was torn in several places and the foot was quite beaten up and shredded. The shame of it all........needless to say I was very disappointed but not totally forsaken. I decided that the only thing to do for this good Cuban cigar was to light it, and at the very least enjoy the pleasant aroma. So back to the Montecristo lounge I traipsed and settled in to a nice comfortable leather chair. As I lit the maimed cigar, it produced quite a flame as the wrapper was quite loose and broken. I made sure I attained a good light of what remained of the foot and decided to actually take a couple of puffs. To my surprise, it was drawing quite well, and the flavors were every bit as good as the first two cigars I had tried, if not better. As I closely monitored the burn and ash of my cigar, the flavors become more earthy, which I really enjoy. Because of the condition of the cigar, this one burned just a little faster than the previous two. Again, the flavor settled down in the 2nd third and I was surprisingly drawing a good amount of smoke. As I started the last third however, the smoke began to turn hot....again, probably due to its damage. This cigar however was the best one of the three. The flavor was full and rich with a hint of spice. All three cigars were beautifully constructed and wrapped in their cedar coverings. I had not expected to obtain such flavor and robustness from a corona sized cigar but then again, this is a Havana. An exceptional cigar which I am sure most of you will enjoy. The winters in upstate New York are long and cold. So one of the delights of springtime is rediscovering the pleasures of enjoying a cigar in my backyard. Cigar in hand, the cares of the day melt away with the warming sun, and for the next hour there's nothing that demands my attention save watching daffodils nod in the breeze or listening to songbirds sing in the trees. Last week, a perfect excuse to indulge myself for a few such evenings arrived from C.GARS Limited - three lovely Romeo y Julieta Belicosos. Each one was perfectly constructed and any would have served to benchmark the classic Havana pyramid. The wrappers were rich colorado, a reddish-brown hue, and glistened with a slight sheen of oil. There was only a touch of veininess, and not a blemish to be found. Although the cigars had a slight give to them, the heft of these belicosos betrayed the generous amounts of tobacco leaf that lay within. The triple caps perfectly tapered, befittingly crowning these achievements of the cigar roller's art. The RyJ Belicoso appeared an aristocrat among cigars, and these samples conveyed their heritage proudly. As wonderful as these cigars looked, the weather proved uncooperative. A cold and rainy string of days forced me to postpone my outdoor plans, and I set out to smoke these cigars in the quiet, darkened corners of the local brew pub and coffee house. There, I removed less than a quarter-inch on the first clips of these cigars. For me, the experience the shape of the pyramid brings provides one of its appeals - the flavors and smoke from the blend of leaves in its large foot, concentrated and carried forward to its narrow head. The pyramid combines the complexity and richness of flavors found in a larger-gauged cigar with the mouth-feel and size of a smaller-gauged cigar. After slowly warming the foot of the Belicoso, I carefully lit the cigar with a few careful and tentative puffs. Despite the small cut I had made, the draw on these cigars was perfect. Just the slightest pressure was needed to bring forth mouthfuls of rich and creamy smoke. From the first this cigar impressed me with its sophistication. It was as if I had strolled into a smoky, sultry Manhattan jazz club after midnight. A woody, almost leathery foundation punctuated with improvisational notes of espresso, walnuts, and tannin enchanted me. I settled in, prepared to allow plenty of time to savor this rich yet somewhat mellow cigar and let its subtle complexities wash over me. I relished each mouthful of the medium-full bodied smoke, letting the RyJ Belicosos reinforce its presence with a long and dry finish. The pyramids all burned perfectly, an indication of both their quality construction and careful storage. As they burned, they produced that dark and solid ash so characteristic of Havanas. About two-thirds the way through the cigar, I carefully shaved another eighth of an inch off the top of the cigar, releasing fresh waves of flavors for my palate to enjoy. I find this second clip especially beneficial for belicosos; it removes whatever tars may have built up and opens and renews the cigar. The last strains of these cigars were bittersweet moments. Would that I could have stretched them a little longer! The Romeo y Julieta Belicoso was a smooth, complex, and refined cigar, without a trace of harshness in its blend. It's not as brash or bold as some Havana's, but it certainly is a rich, almost intellectual cigar, and would be appreciated by any connoisseur. I had a pretty awful week last week and it didn't seem like anything would turn it around, wrong! I was chosen as one of this months taste challengers after only registering for the scheme a few days before and was told I would be receiving three lovely Havana's. I couldn't wait to find out which cigars I would be sent and was not disappointed when it was the Romeo y Julieta Corona. The delicate pleasure conduits were placed into my humidor to recover from the journey. Upon first inspection the three cigars didn't seem to be the best constructed for what I have come to expect from the brand, although they seemed fair enough if not a little rough and veiny. The three cigars varied from each other enough in appearance that I would guess they were likely to have come from a small pack rather than from a box of 25. The wrapper was a nice Colorado shade, perhaps slightly lighter, which I found unusual for such a mild smoke as the R y J. The aroma was pleasing but the cigars seemed to be rather young. The cigars did however seem to be quite firm which I perceived as a possible tight draw problem. With the initial pre judgements I decided to think about what really matters and arranged the objects needed for my cigar smoking ritual. First I usually take my time choosing just the right cigar (in this case it was the R y J corona), I then place it in my ashtray along with my guillotine cigar cutter and my cigar matches. The whole package is then transported to my smoking area. In this case it was a comfy chair in front of the TV. Cutting the cigars was uneventful and the caps came off clean with no flaking. I then had a brief toke just to confirm if my guess about the tight draw had been correct. I am pleased to say I was mistaken, the draw was clear. Lighting was easy and the mild smoke washed my pallet. The flavour was smooth with a mild, salty earth flavour. During the smoke however the flavour became a little inconsistent and I found it difficult to describe the overall taste. A good example of a young cigar. The second smoke was in contrast to the first cigar, the flavour started out almost medium to full, very unlike the R & J. But as smoking continued the flavour panned out and became more medium and what I would expect from the brand. The third cigar was like a dream. It smoked well, the flavour was consistently medium all the way through. The flavour was earthy, rich, extremely aromatic and with a hint of background spice. Truly joyous with everything a Havana should have! I could not believe that three cigars of the same brand and size could be so different. Overall I would say that the cigars are well constructed, had a pleasing taste and aroma but too inconsistent to recommend for any particular occasion. More likely a day time smoke as there was not quite enough punch for an evening smoke but too much for an early. I would not recommend the Romeo y Julieta corona to the beginner but experienced smokers will enjoy the cool spicy and surprising flavour, this one will keep you on your toes! P.S. Thanks for the opportunity to participate in the taste challenge C.Gars. Upon opening the mysterious package in the wee hours (when I was finally at liberty to do so), I was at first disappointed to discover the three Romeo and Julieta No. 2 De Luxe Coronas, "small" cigars that they were. My imagination conjured up adjectives such as "weak," "tasteless," and "unsatisfying," among others, for you see, I am a patron of the long, thick, rich and powerful. However, my initial disappointment turned to delight upon realizing that these were Habanos which I had not previously experienced in my twenty or so years as a lover of the Cuban leaf, so it was clear that a bit of objectivity was in order. Getting down to "work," I took note of the beautiful chocolate brown wrappers and the excellent construction. None of the cigars had hard spots which could spell out "plugged," nor did they feel too soft and spongy. Although none gave off any discernable fragrance, they certainly looked inviting enough - and who am I not to accept such an invitation? I immediately proceeded to light the first of the trio, even though the time was one a.m. For the sake of variety and curiosity, the other two smokes were enjoyed in the morning and in the early afternoon, respectively, on different days. All three were accompanied by filter coffee, although I "cheated" with the first one and had some great port as well. Describing one of these R&J's would be describing the lot, since they were all amazingly consistent in their smoking qualities: all had a perfect draw and very even combustion; all sported a fairly solid medium-grey ash and all were as mild and smooth as a babe's tush. The bells of piquant charm have rung! This cigar was briefly reviewed in 2002, by two of Mitchell's devotees, Ray and Asgard. The cigar has had a few years to mature, and lay in my humidor with its brother Cubans. Anything I say to the contrary vis-a-vis what these two fine guys wrote, ought to be chalked up to the way the cigar develops. At 4 7/8 x 50, this cigar is a little dynamo. It is certainly to be classified as a Maduro, and has developed quite nicely. When I got the cigars they were totally matte, and now they have blossomed to a silky smooth, oily appearance. The cigar was firm when I first received them, and they have not changed one iota. The only negative I could find is the very slight uneven cut of the foot. Perhaps the chiropractor had a few Mojitos with Mitchell before going back to the factory. Who knows? The placement of the band is a bit higher, above the Edicion Limitado banding, compared to many of the other vitolas. See, I found another 'fault'. When you get your box, look at the cigars, carefully, and let me know if they are staring back at you. I believe this particular cigar has a life of its own, waiting to give up pleasure to its owner. Perhaps I have had a few too many Mojitos. The cigar cut a little unevenly but I noticed it was the fault of my very old and war beaten Xikar cutter. Perhaps I ought to be more careful. The first draw brought a bounty of smoke and had a rich flavor. The flavor reminded me of being in a room with old leather chairs, sitting in front of a lit fire in the open hearth, burning freshly cut logs. All I needed was a snifter of cognac to complete the picture. I experienced a flavor of espresso beans - not the coffee, the beans. Go ahead and try this experiment for yourself: take a freshly roasted espresso or French roast coffee bean and chew it. When you do this you will really understand my description of the flavor of the cigar. Although the ash was askew, it held firmly to the body until removed. It had a deep gray color and upon testing, was crunchy to the touch (as opposed to powdery). The cigar smoked very cool and evenly, and developed a mellow, creamy, flavor, about Â½ way through. Somewhere along the way I noted a light burst of spice to my lips, which surprised me yet did nothing but enhance the delight of this vitola. I consider the cigar to be medium to full-bodied, and a super smoke any time of the day. The cigar is certainly nothing like my memories of having smoked one when it was fresh off the production line. Age really makes this cigar a pleasure to smoke. At the going price, I would get a few boxes. Frankly, I am in awe of all the Edicion Limitado vitolas, and cannot wait to review the balance of the group. After 30 years in Beverly Hills, I recently moved my office to Westwood, the home of UCLA, young women, and cheaper rent. A two storied English Tudor building, my office has a fireplace, kitchen, media room, and indoor plumbing. The weather in Los Angeles has been somewhat irregular, of late. Though the middle of winter, the temperature has been in the high 60's to low 70's. On a particularly chilly morning, I decided to light up a Romeo y Julieta Cazadores, sit before the fire, freshly brewed coffee in hand, and prepare a tasting review. The Cazadores is not a cigar to be taken lightly nor smoked indoors, at least where there are nonsmokers skulking about. Since the only other person in the office is Lee Albert, aka Havana Lee, there were no problems (other than his trying to mooch a Cazadores from me). One must understand that the Cazadores is a much maligned and misunderstood cigar. I hope this tasting review will set the record straight, and the reader will appreciate the wonder of the cigar. The Cazadores is in a class by itself. It is 44 x 6 7/16, and ofttimes described as an ugly, veiny, cigar. As a matter of fact, I am used to opening boxes of these cigars and, upon unwrapping the foil which the cigars are in, marvel at how ugly they are, but how heavenly the initial aroma of the tobacco, is. Surprisingly, then, this last box, purchased in Paris, stamped October 02, contained fairly pleasant looking cigars. The cigars were lighter in shade, perhaps a medium Colorado, and smooth to the touch, with only a hint of oil on the leaf. Upon close inspection, I noticed a light dusting of bloom on all the cigars. I could not say anything negative about the manner in which the cigars were prepared, in fact, they were all perfectly rolled, capped exactingly, and the feet well manicured (ok, give me a break, I have to at least try to be funny). A cazadore is a hunter and, thus, the cigars are "hunters." One need not hunt for anything, in this cigar, however. It is an "in-your-face" cigar. Nothing is subtle or hidden. While several well-known writers have described the Cazadores as "violent," such label is unfair. Perhaps they just have not had the opportunity to smoke all types of cigars, or they are timid or just Poofsters in the guise of an intelligentsia vis-a-vis cigars. Whatever they are, they simply do not understand that many of us need the kick of a full-bodied cigar. Certainly, the cigar is spicy, but not so much so that it burns your lips or tongue. There are hints of burnt espresso beans and even a subtle and dancing sweetness to the wrapper, throughout the smoke. In fact, about half through the cigar I noticed a slight taste akin to winter berries, a little tart, a dash of sugar, and full of spice. The cigar never gives up trying to satisfy you, building to an explosive end. Without a doubt, this is a fantastic cigar, bearing all the delights one could desire in a full-bodied Cuban. If you are adventurous, I suggest opting for some aged Cazadores; they tend to be a bit milder, yet fulfilling the need for a 'real' smoke. In fact, the Cazadores is a throwback to the early Halcyon Days when Cuban cigars were for men, not made to please anyone but the smoker. And pleasing this cigar is, have no doubts about it. If you have never tried a Cazadores, I can flatly state that you do not know about Cubans. Just remember that this cigar is for the well-heeled smoker. It is worth the price of admission..
A rarity for Cuban cigars - all writers agree that this is an excellent cigar. Thinking myself a writer, I have to agree. I purchased a cabinet of this cigar and laid it away for a few weeks to settle, in my humidor. As I slid the cabinet lid open, I knew immediately, from the aroma wafting before me, that these cigars were going to be wonderful. I wasn't wrong. While I generally write a review after smoking one or two cigars, I wound up smoking five before I sat down to write about the cigar. Frankly, I was awed by the first to the point that I thought the wonder of this cigar must be a fluke. After my fifth cigar I came to the conclusion that I had to purchase another cabinet of these great cigars. The cigars were all firm, silky, a little deeper in hue than a Colorado Maduro, and finished by a holy driven hand. All were an exacting 5 x 48 with no distinguishing imperfections. By the time I smoked the fifth cigar the remaining cigars in the cabinet were beginning to show some bloom. The feel of the cigar was very pleasant, all having a subtle fruity and floral aroma to them. Pushing my semi-Bergerac nose into the cabinet, I was able to attest to a light sweetness as well as an occasional whiff of cedar. I was reading James Ellroy's Clandestine as I lit the last of the cigars. The cigar lit without hesitation and gave off a delightful floral aroma. The draw was perfect and, from the first, began to develop from a light to a full medium smoke, at the wondrous climax, nearly doing in my lips. The cigar was fresh throughout, always maintained a light sweetness, and happily developed a floralness unlike any other cigar. The cigar is certainly aromatic but it never appeared to be overwhelming. There was always a fruity flavor to the cigar, never overshadowing the other flavors and aromas. The finish to this cigar can only be described as BIG. With a perfect draw, running once or twice, the flavors all combine at the last third of the cigar. This, to the extent that I laid down my book and simply savored the cigar, making sure nothing interrupted my pleasure. I have noticed a distinct difference between the cabinet and the boxes of 25. There is more flavor and aroma in the cabinet cigars and I suspect they will age better. I already placed an order for a second cabinet. It's winter. It's cold. 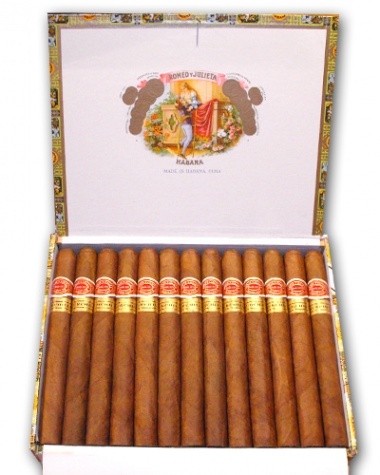 I have the task of doing a tasting on a set of RyJ Prince of Wales cigars. I held to my duty and, when all but the last tip was gone, was reminded of what Cowper wrote, in "The Task." "I crown thee king of intimate delights, Fireside enjoyments, home-born happiness, And all the comforts that the lowly roof Of undisturb'd Retirement, and the hours Of long uninterrupted evening, know." This cigar is a Churchill, and has the same dimensions and weight as the Churchill. There the difference ends. At 7 x 47 (178 x 19), this cigar has more character than its more famous brother. Rudman describes this cigar as milder than the Churchill. Wrong! This cigar has a depth that the Churchill lacks, though it is not as pretty as the later. As with a woman, beauty is more than just what you see, it is a measure of all the senses. This cigar suffers from its name, Prince of Wales. It is not drab, like Charles, Prince of Wales, nor is it youthful, like William, Prince of Wales. Perhaps if we go back a century to Bertie, Prince of Wales, we might get a connection. Bertie was a breath of fresh air compared to his Mum, the Mourning Queen. So, this, the RyJ Prince of Wales, is a fresh smoke, deserving of more attention than it gets. Past experience with this vitola does not ring true, today. I would venture to opine that this cigar ought to be purchased instead of its more well known brother, the RyJ Churchill. The samples I tasted were both a little under humidified, and somewhat firm. They were a little dry to the touch yet at the same time, smooth. The caps were not as precise as with other RyJ selections, but it was quite nicely rolled. Looking up from the foot of the cigars I noticed that the draw would be easy, and it was. The cap cut well and lit without hesitation. The cigars burned perfectly and, although smoked outside, in the cold, did not need to be relit. At first there is a hint of young leather which passes to a cedar flavor, quite subdued, but there, nonetheless. After a few minutes you can be assured of a stronger aroma, very pleasant, like burning leaves far off. The smoke ripens at the first half and develops a woody and slightly sweet undertone, the cedar flavor never obtrusive yet always there. Although I smoked this cigar outdoors, I vouchsafe that it would not present any malodorousness indoors. The ash was soft and powdery and even through the last puff. While the foot ash was quite dark, the rest of the ash was a silvery gray with only hints of breaking up. It held fast to the tip and had to be tapped off. Almost all the reviewers say that this cigar is "earthy" or "discreet" or even "less exuberant" than the Clemenceau or Churchill; they are all off by a mile (kilometer for those on the other side of the pond). Although the provenance of the tobacco is the Vuelta Abajo region, it is not as full bodied as many from Pinar del Rio, yet it carries its weight well. I don't this you can go wrong in purchasing a box or two of this vitola. I was surprised that such a young example was so mature. I look forward to smoking a few more in February. Hold the presses! This is a fantastic smoke. Not only were the samples I set aside for review great, but every stick in the box was "right on." While it is still winter in L.A., and thought I set out to taste these cigars on my patio, in the cold, it was 76 today! Oh, well, I still had my cigars to smoke even though it was mild outdoors. I set aside a full glass of Sandeman sherry to sip while savoring the No. 4's. I was fortunate to have selected a fine wine to accompany the smoke, especially as the cigar seemed to cry out for a slightly sweet drink. Samuel Johnson wrote, several centuries ago "It is better that some should be unhappy than that none should be happy, which would be the case in a general state of quality." What, you ask, does this have to do with the cigar in question? Well, it's rather simple: I'm smoking this uncannily superior cigar and you aren't! The No. 4 is a Robusto, more correctly a Hermoso No. 4.; thus, its name. It is 5 x 48 (12.5 cm x 1.9 cm) and every cigar in the box was the same (as if sameness could be considered wrong). My dress box of 25 was very nice though I would love to have a cabinet of 50 (SLB) to store in my humidor. From the first, this cigar provided delight. The entire box had a sweet, fruity and cedary aroma. The cigars were a deep colorado. All looked rich, silky smooth, and when handled, supple yet not fragile. The cap was immaculately done and the foot was cut to perfection. This cigar was made to be smoked, but not before all the senses took it in. There was a distinct rich fruity taste before lighting. I was amazed at the quality of the cigar and lit it, quickly. The cigar lit well and burned evenly to the end. Cedar, floral, and fruit immediately came through from the first puff. While there was a sweetness to the cigar, it was subtle, not overpowering. The rich flavors never faltered and the cigar had a most perfect draw, cool and inviting. The aromas that wafted in the area caused me to stop for a moment and take it in. Marvellous, at the least. While there was no crescendo at the end of the smoke, the flavors and aromas only seemed to mature to the point that I simply had to light up a second one less The cigar was rich and medium bodied. This vitola is not of the old school of Havanas, but of the new generation, waiting to be discovered by one and all. I would ascribe the term "fresh" to this cigar and would not be surprised if it became one of the best sellers in this size. The taste lingered for a short time and left me with a fruity taste in my mouth quite unlike any other Havana. This is one cigar which I would very highly recommend and, if C.GARS Ltd's selection is all of the same mien, I would buy it quickly. Not one of my past favourites, I was a little concerned over the samples of this cigar being sent for my review. I almost sent them back to C.GARS but for the fact that the has been 100% on the money with all their selections. The cigar did not present with any noticeable aromas, out of the package. The cigar looked nice and the color was medium claro, as well as smooth. As a matter of fact, I could almost hear Vivaldi 'Autumn' playing in the background, the hue of the wrapper was so 'that time of year. Perhaps it was due to the fact that my office window was open and we were having the first light, cool breeze after a Summer of Heat. Not to be outdone by my imagination, I placed a Vivaldi CD in my computer and started my inspection of this cigar. All three of the selections (the cigar, not Vivaldi) measured precisely 165mm by 16.7mm (I bought a really fancy caliper for these tasting notes). Each was wrapped to within a fraction of perfection, and none had telltale bumps, soft spots, or prominent veins. The cigar clipped without incident. And had a mild woody taste before lighting. The foot was even and the tobacco was packed very neatly. The wrapper was perhaps a little richer than matt, but not that much. The cigar lit without much flame and the first draw of tobacco gave me a pleasant mouthful of light spice, wood. The initial aroma was a bit dusty but there was an almost immediate transition to an open woodsy undergrowth. The ash was deep gray and a little loose. At first the ash seemed to mock those who have Peyronnes, but after the first inch, all was straight. Nothing exciting happened through the base of the cigar and about 1/3 of the way through the body, the taste mellowed and was a bit exotic, as if you were in a forest after a light rain, the Ozone smell just beyond reach. There was nothing complex about this cigar though I got ample smoke from it and it burned just a little hotter than I generally like. Towards the end of the body the aroma became richer, stronger, but the heat remained at a level which did not impair the enjoyment of the smoke. With a little less than 60mm to go, the cigar softened and returned a rich taste, a bit tart, but still very pleasant. I was not surprised about the herbal quality which was now somewhat prominent, and was hoping for a great finish. At no time did the woody taste go away, likewise, it never developed and never ebbed. The finish to this cigar was not super but it was pleasant, nonetheless. The cigar smoked dry yet it never lagged in taste, aroma or flavor. I was glad that the cigar did not end up too hot yet was unhappy that the taste did not linger. In all, the cigar was a perfect example of what you would expect of this vitola. No surprises, no disappointments, only a pleasant smoke, well worth your time with the caveat that, if you expect this Lonsdale to be one of the best, you will not be happy. Do not think I am dissing this smoke, I rather enjoyed it and it was, indeed, worth my time. It is inappropriate for anyone to smoke only one brand and one vitola. It takes away from the experience if you do not try all the vitolas available from the different houses. I will certainly keep this cigar in my humidor and smoke it from time to time. I am interested in seeing how this cigar ages and will write more about it in a few months.